The Church of St. Botulph, Hardham, is thought to date to the eleventh century or perhaps a little earlier1 and its fine series of wall paintings are considered to have been added in the twelfth century. 2 The paintings began to deteriorate in the 1970s, as the result of moisture penetration onto the internal faces of the walls, and in 1978 the Diocesan Archaeological Consultant was invited by the architect, Mr. Geoffrey Claridge, to examine the footings prior to the preparation of a scheme to improve the drainage around the building. Partly as a result of this investigation, major restoration works were undertaken in 1981 and these included repairs to the roofs, the repointing and re-rendering of all external wall surfaces, and modifications to the drainage system at ground level. Whilst this work was in hand the authors were able to undertake a close study of the external faces of the building and to record details of its construction which are unlikely to be available for close inspection in the foreseeable future. Two trenches were excavated to underlying natural sandy gravel in 1978 (Fig. 9 Areas 1 and 2). In both cases the very disturbed loam layer (Layer 1), which is the accumulated soil of the graveyard, was up to 1.2 m deep and covered inhumation burials (Layers 4, 5, 6, 8, 10, 11 and 12) dug into the underlying soil (Layer 7). One of these (Layer 11) was sealed by clay (Layer 9). Two small stake holes were encountered (Layers 14 and 15). The base of the south walls of both the nave and chancel were encountered at around 6.1 m above Ordnance Datum and these were laid directly on unmortared footings originally placed in trenches, between 0.4 and 0.5 m deep, cut through topsoil down to the sandy gravel. No dateable evidence was recovered and the lowest graves were left in situ. No trace of the supposed anchorite's cell3 was encountered on the south side of the chancel. In July 1981 the waterproof rendering was removed from all the external faces to expose the stonework and mortar joints of the original building (Plate 8). The joints were subsequently re-pointed and the external faces re-rendered in a mixture of lime putty, stone dust, sharp washed Midhurst sand, and crushed brick. 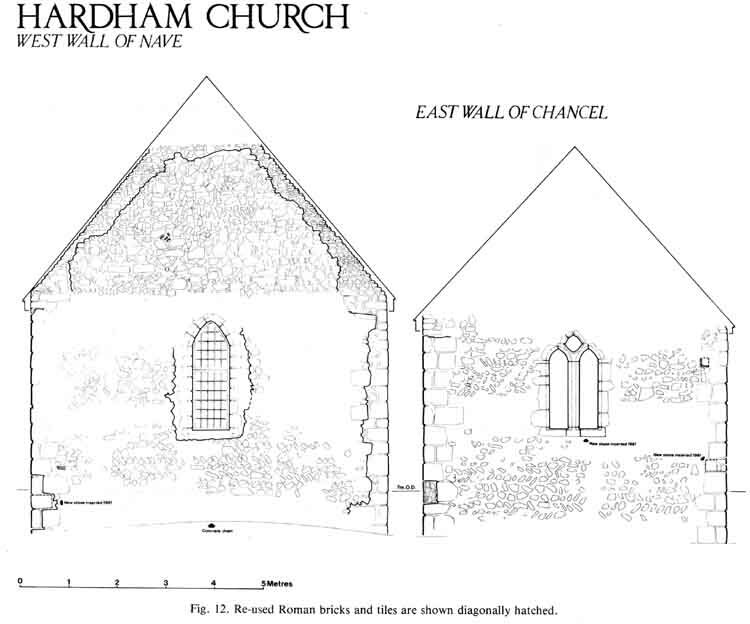 The exposed wall faces were closely studied and stone by stone elevation drawings were completed for the north and south walls of both the nave and chancel (Figs. 10 and 11), that for the north wall of the chancel being completed after re-pointing. 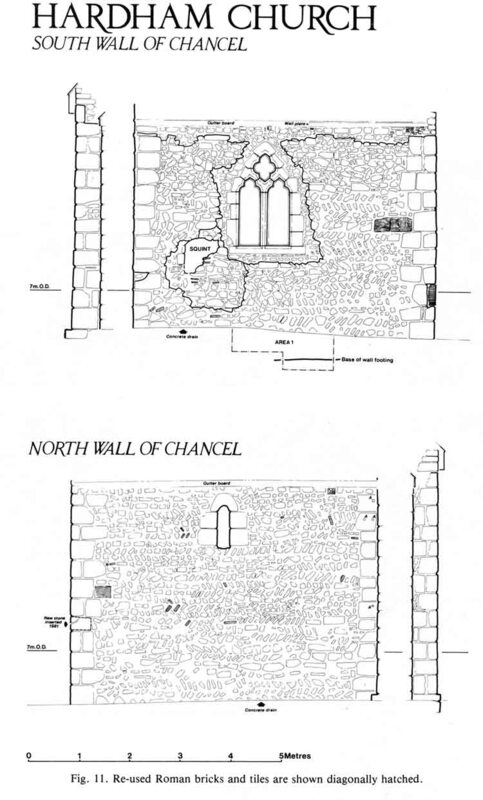 The west wall of the nave and the east wall of the chancel were partially recorded (Fig. 12). The worked stone used throughout the original building is local sandstone, probably from Pulborough, with a few pieces of greensand, and the rubble infill is a mixture of sandstone with a few re-used Roman tiles, and a little flint and chalk. All this is set in a hard pink mortar. 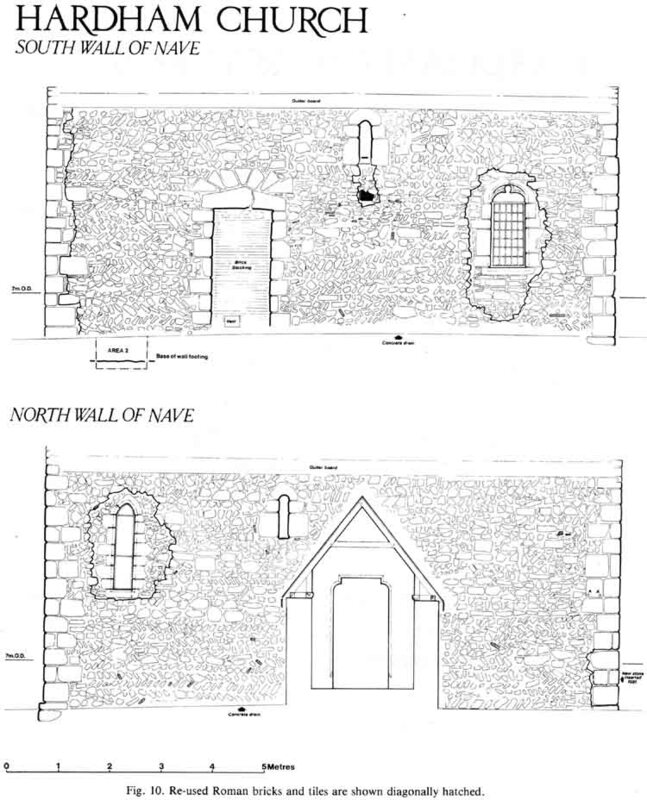 The small single-splayed windows in the north and south walls of the nave and in the north wall of the chancel were found to be part of the original structure as was the south doorway in the nave (Plate 9). The remaining openings and the squint in the south wall of the chancel are all later insertions. 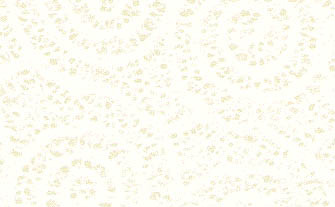 The inserted window above the squint may have replaced an original opening in the same position. The south-west quoin was found to be rebuilt throughout its height but the other quoins appear to be intact with the exception of a few repairs which include, in the south-east quoin, medieval roofing tiles. On the north face of the north-west quoin and at the junction of the chancel and nave on the north side several stones have square holes cut in their outer surfaces, each measuring about 3 cm across, and each containing a wooden peg (Marked `A' on Figs. 10 and 11). The authors are grateful to the architect, Mr. Geoffrey Claridge, and the builders, W. Allfrey and Sons, of Pulborough, for their help and advice, and to the Sussex Archaeological Society for a grant from the Margary Research Fund to assist with the cost of undertaking the drawing of the structure. The original set of drawings has been placed in the West Sussex County Record Office. 1Taylor, H. M. & J. 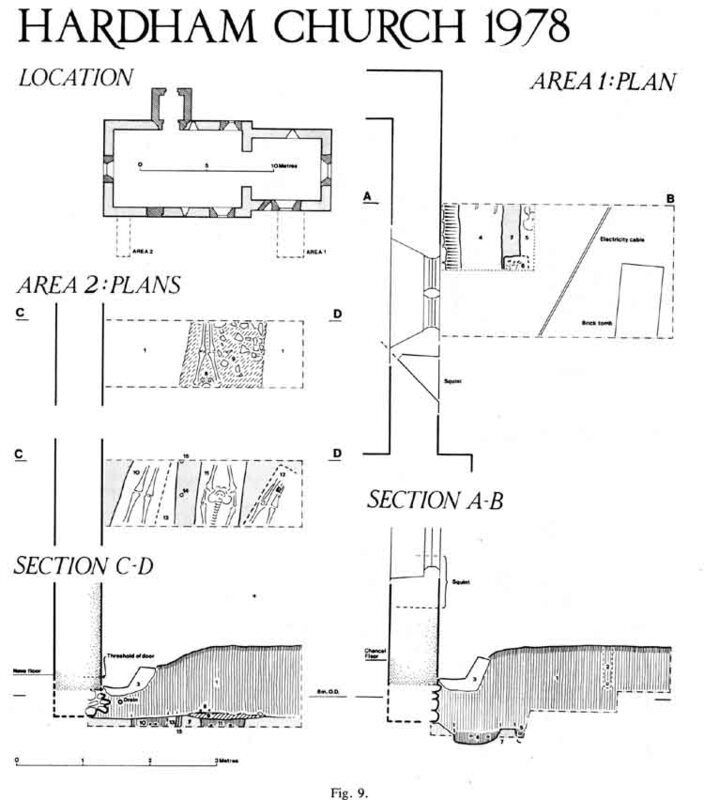 1965 Anglo Saxon Architecture Vol. 2, 283-4. 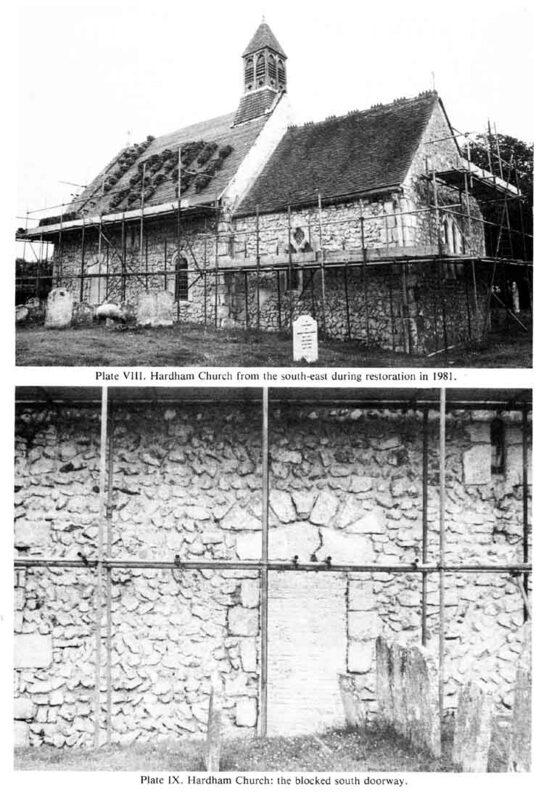 2 Johnston P. M. 1901 `Hardham Church, and its early paintings' Archaeol. Journ. 58, 12-92 and Collections 44, 73-115; and Bell, C. 1947 The Twelfth century paintings at Hardham and Clayton (Lewes). 3 Johnston 1901 op. cit.